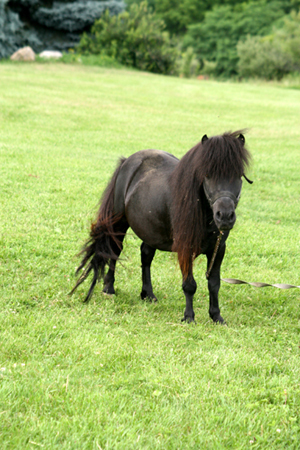 Hickory Springs Falabella Miniature Horses and American Miniatures established in 2012 originally began breeding Welsh Ponies in 2001. We have downsized our Welsh breeding program to accommodate the introduction of the Falabella horse program and American Miniatures at our facility. Our farm is situated in the historic township of Lima, in the gorgeous Finger Lakes Region of Upstate, New York. Our wonderful facility for our Falabella Horses and American Miniature breeding programs, is located on a gorgeous hilltop overlooking the Hemlock and Bristol Hills. We have acres of grassy pastures and woodlands surrounding our property. The facility includes a twelve stall barn with a heated tack room, multiple pastures and paddocks with run-in sheds and well groomed trails. Our two separate herds of miniature horses(Falabellas and American Miniatures), love to romp and play atop our rolling hills here on the farm. This facility is a dream come true, as we had been searching for the perfect small-sized farm in this region and we found it! Our private facility is the perfect place for our friends and family to gather for riding enjoyment and fun with minis! As a breeding farm, we enjoy raising our pure Falabellas and Registered American Miniature Horses and handling our babies from birth. Each baby is imprinted and loved by all that come to Hickory Springs. We take our time raising the foals to be not only people friendly, but herd savvy by turning them out together daily. 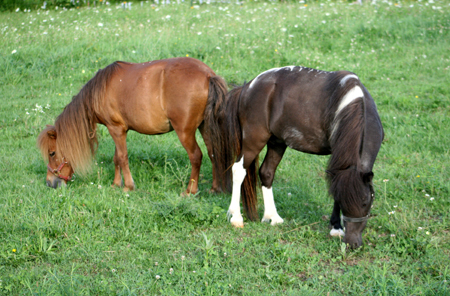 Our miniatures are outdoors as much as possible, allowing them to be free to roam, graze and bond with their herds. 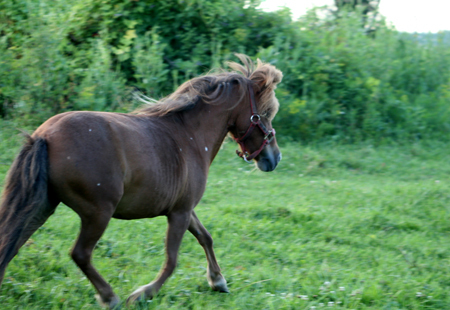 We pride ourselves in having some of the nicest imported and domestic bred Registered Falabella Miniature Horses and American Miniature Horses here at Hickory Springs. We have many colors available in our breeding program, however we do focus on breeding conformation, intelligence, temperament and our focus is on Appaloosa Miniatures! We do accept a select few outside mares for breeding to our studs. Our breeding program begins on April 1st and ends on June 30th of each year. Please contact us for availability and scheduling to make sure you get the chance to breed to one our our lovely stallions. Breeding contracts are adhered to, so please do note that if you do sign up to breed your mare to one of our stallions, the stallion service fee must be paid in advance and the mare must be bred during the scheduled breeding period (April-June only) Contact us for more information regarding prices/payments to breed to our stallions. A big thank you goes out to both Diane Wolcott and the late Dr. Barbara Sreenan who helped us establish our excellent breeding stock from old imported Argentinian Falabella lines. Our horses' pedigrees go back to Chianti, one of the first Argentine imports from the Regina Wineries in California, who were one of the first known importers of the Falabella breed of horse in the United States. Below is a picture of Ferrari our pintaloosa stud, sired by none other than Tamboro who is a top notch snowcap stallion, and out of Peppermint Patty, a regal and refined show quality pinto mare. 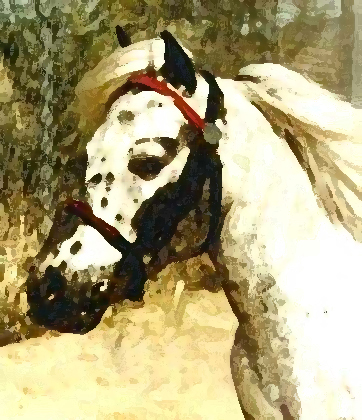 The first Falabellas to arrive at our farm were Sreenan's Snipette, a beautiful black and white pinto mare with lacing across her back and our second mare, Sreenan's Sunset Glory, a lovely snowflake chestnut mare. Both mares settled in nicely here on the farm. Soon after the mares arrived, our flashy stallion, Sreenan's Hot Shot along with another outstanding stallion, ICF Ferrari, a gorgeous Pintaloosa (sired by the well-known snowcap stallion, Tamboro), settled into our program just in time for spring breeding. Over the past several years we have added and improved upon our line-up of outstanding stallions to breed to the very best mares we have here at our breeding facility. Our registered mares and stallions come from the best of the best with some of the oldest lines in their pedigrees. As for our Falabella stallions, we have Chianti, Zumbador, El Rey, Tamboro, Gross Hills and AF Falabella lines. For our American bred stallions we have Legendary Bullet, Little Kings, Bond, Dell Teras,Van Huttenest, Moss Grove, Flabys, Gold Melody Boy and many others that add to our diversity of color, size, conformation and intelligence in our horses. We are very excited about this year's foal crop. Foals begin arriving at the end of March and will continue through the spring and into the summer 2016. Sires of this year's Foals: Hickory Springs Ferrari, AF Revenge, Darkstar Armani, and Spotted Dreams Beau of Mine. These gorgeous stallions will be stamping their foals with a variety of patterns colors and sizes! Our future looks bright as we strive to produce only the best 100% pure Falabella foals from our foundation breeding stock. We are also looking forward to the American Miniature foals we are expecting too. We are looking forward to those babies hitting the ground this spring. We have bred for excellent conformation, super temperaments and outstanding color! For the full history on the wonderful Falabella Horse breed, please visit: FALABELLA INTERNATIONAL PRESERVATION ASSOCIATION. We want to especially thank Diane Wolcott of Castlerock Miniatures for her expertise and support in helping us develop both of our breeding programs. 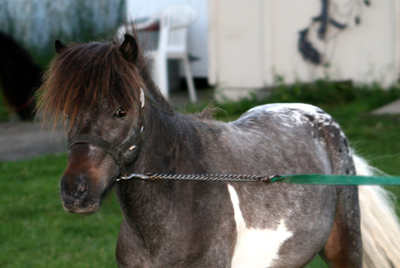 Ms. Wolcott has years of experience with both American Miniature Horses with a focus on Appaloosa breeding, and the Pure Falabella Miniature Horse. We would also like to thank the late Barbara Sreenan for selling us the last horses of her herd to start our breeding program. With many other breeders to thank such as Lori Rober of Lasting Joy Ranch, Dawne Smith from Land of Little Horses, Dianne Wilson of Spotted Dreams Miniatures, Edna Holloway of Holloway's Falabellas and many others for allowing us the honor to purchase and breed to the most wonderful Falabellas and American Minis for our farm. Thank you to all who have supported, helped, and advised us over the years! 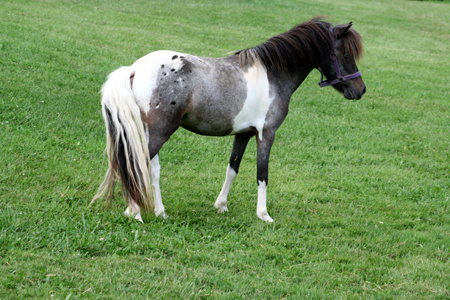 Our goal is to grow our herd of Pure Falabellas and preserve the beauty of the rare Falabella Miniature Horse!